Our state (Tennessee) is moving to the Interactive Read Aloud model as a component of our ELA instruction very soon. I have been using them for the past two years in kindergarten and first grade. I love that you can cover so many standards within each lesson, and I LOVE introducing my students to such quality literature at the same time! At first, I was concerned that students would grow tired of hearing the same text over and over, but it was just the opposite. (Plus, you don't read the whole text everyday.) Students became so engaged and attached to the books I used, that they wanted to hear them over and over again. They even wanted to borrow them during independent reading time. If you asked them for their favorite book titles, it was inevitably one of the books they heard during the interactive read aloud. I felt like I wasn't going deep enough in my read aloud instruction, so this summer, I read lots of research and decided to start creating my own. It's a huge task, but I am loving it! 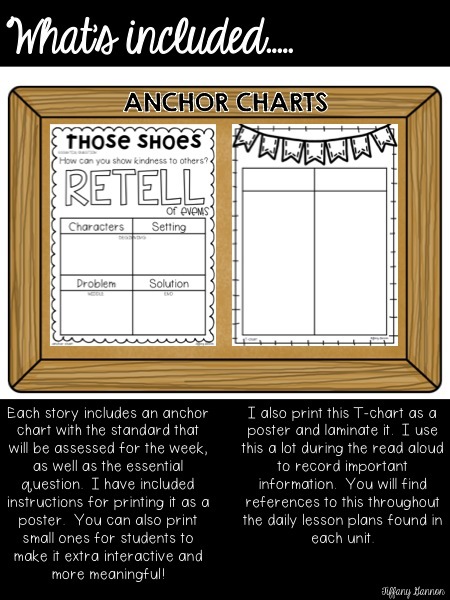 I feel like it has given me a greater grasp on choosing complex text and making sure I cover all the things that my first graders need to be successful readers. 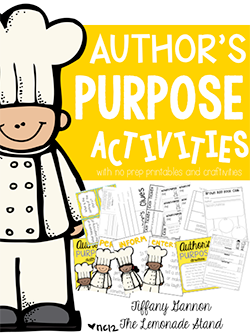 The purpose of this post is to take you through what an interactive read aloud lesson looks like and what it looks like over the span of the week. I always like to see what it looks like in other teachers' classrooms, so here we go into mine! And I know that creating interactive read aloud lessons is very time consuming. That's why I have created this series of lessons. Hopefully, they will save you lots of time and energy that you can then use to teach your little ones. Tennessee now uses the TN Ready standards rather than Common Core, but they are almost identical. 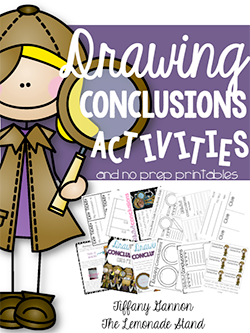 I included both sets of standards within each month's pacing guides, along with a summary of the main skills or strategies covered with each read aloud. 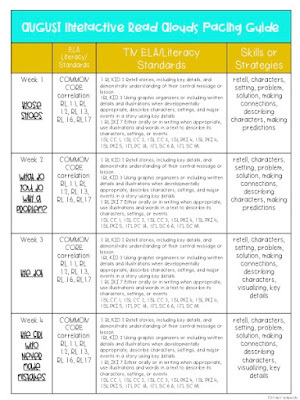 Not only are we expected to teach the Literature and Informational text standards, but we also have to cover the speaking and listening standards, as well as the vocabulary acquisition standards. I included a checklist of those standards, along with student grade sheets for both TN Ready and Common Core. Each unit includes posters for the skills and strategies covered. I have a reading bulletin board in my room where I hang these for the strategies covered that day. I keep the rest close by, so that they can easily be changed out when needed. I also have a mini-pocket chart where I store the vocabulary cards for the week. 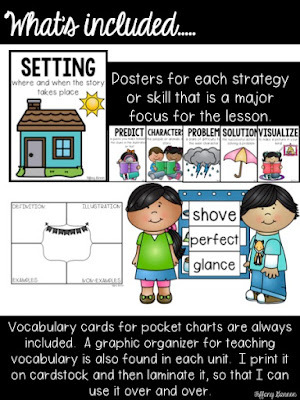 (A vocabulary instruction card is included that shows you the specific steps to take to teach each vocabulary word." 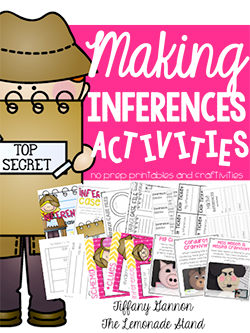 And, of course, I had to include some interactive anchor charts! I show you how to print them as posters in Adobe. We complete these together to make them interactive. 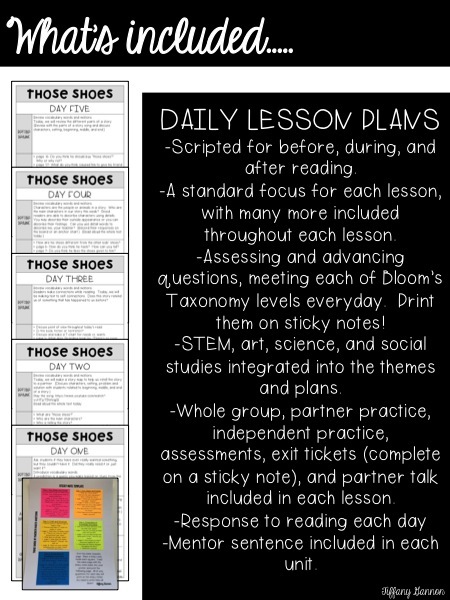 I print the weekly lesson plans the week prior to that read aloud. I like to print on Astrobrights so that I can do a different color for each day. I also print the questions that I ask during reading on sticky notes to match the color of the plans. This way, I am not having to refer to that piece of paper for my questions. I can just use my sticky note! 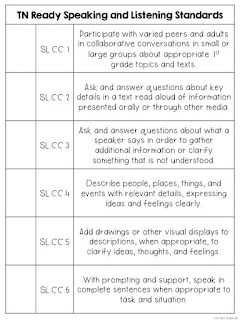 The questions included for each day hit all of Bloom's Taxonomy's levels. The questions also progress each day from covering Key Ideas and Details, Craft and Structure, and finally, Integration of Knowledge and Ideas. You don't want to focus on solely one strategy during a read aloud. I might refer to one heavily, but I am hitting lots of others, too. At the end of the week, I give an assessment that assesses that skill I focused on more heavily than the others and include it at the top. Let's break down what a lesson looks like for one day. I always start with something that gets their attention! It might be a song related to our theme for the week. I might do a little activity related to the strategies or skills we are practicing that day, like the inferencing bag below. It's always something to get everyone excited and engaged! We then do our I can statement and cover or review our vocabulary for the week. 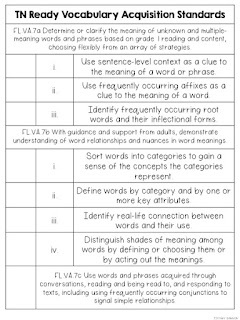 I include in the unit the steps I take to teach the vocabulary. Vocabulary is a crucial component of the read aloud, so it's important that you hit it each day. We then move into the actual read aloud. On day one, you do not want to stop very much. I usually have students make predictions or visualize. They really want to just hear the story at that point. But on other days, there is lots of questioning, partner talk, and think alouds during reading. After reading, students always respond in their journal. I use this time to assess their understanding of the standard and to incorporate some language instruction. It also gives me insight into how they are interpreting the text. (It's very easy to differentiate during this component, which I love.) I usually have them write independently. Afterwards, we get with a partner and share our thoughts. They discuss what is the same and what is different. Lots of higher order thinking going on! Afterwards, we wrap up our lesson and discuss what we did that day. We also talk about what tomorrow's read aloud will look like. Finally, we finish up with an exit ticket. Usually, I have it displayed on my PowerPoint and they respond on a sticky note or a whiteboard. Nothing fancy! Friday, or the last day, of the unit looks a little different, since we take the assessment. I also always include something fun to do related to the theme. It might include a craft, an art piece, a STEM challenge, or a science experiment. Of course, you don't have to do that on Friday. You could include it on any day of the read aloud. I am still working on a storage plan. So far, I am organizing in binders. But I may move to clear file storage bins. I am knee deep in MISSION ORGANIZATION! Lol! 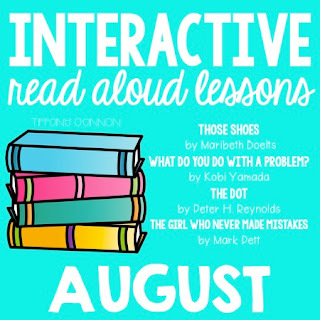 August Interactive Read Aloud Lessons are posted! September will be posted by July 31st. I will always try to have each unit posted one month before it is needed. I will also post it on sale for a short time, so be sure to follow my store and Instagram so that you can a notification as soon as it is posted! 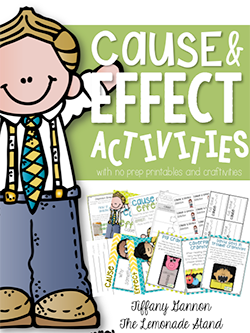 I hope these help with your read aloud instruction and make this a favorite part of your day!